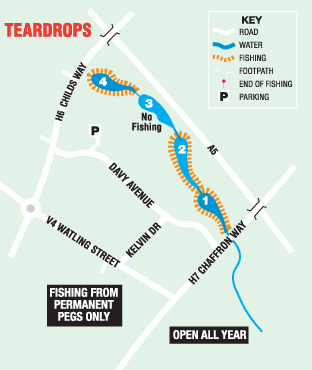 Fishing from the permanent pegs only on Tear Drops. Do not fish number 3 lake as it is out of bounds. In the past they have produced two perch to 4-10-8 plus good roach, bream and hoards of gudgeon. Carp washed down from Furzton are growing fast 15lb is not un-common. Programmed stocking is bearing fruit with tench to over 6lb showing. Tear Drops can be a superb "bite-a-chuck" pleasure fishery throughout the season. Reasonable size chub are known to haunt these waters too.